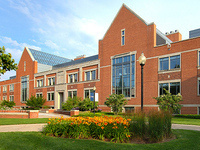 The Department of Biology is housed in the A. Paul Schaap Science Center, one of the nation’s premier undergraduate science education facilities. We use modern equipment to support innovative research and coursework. The A. Paul Schaap Science Center includes a variety of facilities for several different interests. From computer labs to biochemistry labs, our science center has all you need to launch your career in the sciences. We also boast many faculty/student research labs, an aviary, animal rooms and state-of-the-art environmental chambers. A personal visit to the biology department is the best way to see and understand our unique research and learning opportunities. The biology department utilizes state-of-the-art equipment to perform research in cell biology, molecular biology, microbiology, ecology, genetics, neuroscience, behavior, physiology and bioinformatics. Students work independently or side-by-side with faculty to use this equipment for their research projects. Departmental computing facilities are excellent. In addition, students and faculty doing research in biology have access to a wide range of equipment and professional expertise in other science departments. The 1,750 square-foot greenhouse has been a facility of the college and the biology department since 1972. It provides an environment in which experimental plants can be cultivated to allow student-faculty collaborative research, functions as a repository of a diversity of living specimens that are used in many botany and general biology courses, and provides an opportunity for the biology department to reach out to community in informal education of people of all ages. Hope College Herbarium (HCHM) is located in room 3051 of the Schaap Science Center and holds about 8,000 specimens mostly from the West Michigan area with a rich collection of asteraceous plants. Our herbarium specimen images are online in the Symbio Portal. To make reservations for Morningside Park, please contact Hope College Events and Conferences (616.395.7222). Morningside Park is located on the corner of 32nd Street and Morningside Drive in Holland. It spans 1.6 acres and was donated to Hope College in 2007 by its former owners, Merle and Arloa Prins. The beautiful park features a gazebo (often used for weddings), a nice shed to store tools, and a quaint bridge over a stream. Along the shaded paths, there are many different kinds of plants used for a variety of medicinal purposes. The park functions as a botanical garden for education, research and public display. Representative plants are being selected and planted to educate students (kindergarten through college) and the general public about plant diversity, evolution and relationship to human society. During a first run through the park, beds were identified as areas in which medicinal plants could be planted as well as what native medicinal plants were already known to exist there. Twenty-five species of plants were acquired and planted in Morningside Park. All 25 are known to have been used in the past or present in medicinal products, as remedies of Native Americans and/or in current drugs for treatments. To learn more about the layout of Morningside Park, see the map of the park. The Van Kley Science Museum houses a large collection of live animals, including small mammals, amphibians, reptiles, fish and birds. Over 20 different species, from tiny marine invertebrates to an 8-foot boa constrictor, can be found in the museum. It is also home to a wide array of animal artifacts such as bones, skulls and shells. The science museum is staffed by Lori Hertel, the museum director and director of laboratories for the biology department and by students from Hope College. Many of the students are biology majors in the pre-veterinary medicine or education programs at Hope College. The history of the science museum dates back to 1904, when a room on the third floor of the then-new Van Raalte Hall was designated to house the collection of “curiosities” the college had collected since its founding in 1866. By 1915, this collection included weapons, shells, animals skulls, replicas of famous statues and over 5,000 specimens of moss. At the time, only a few community members took an interest in the museum. When Van Raalte Hall was renovated after World War II, and the museum bacame accessible by only a narrow emergency staircase and was largely forgotten. The crumbling collection was rediscovered by a group of students in the late 1960s, and in 1974, the biology and geology departments began moving items from the collection to the new Peale Science Center for safekeeping. This collection soon evolved into the science museum. When Peale was renovated and the current A. Paul Schaap Science Center constructed in 2004, the expanded Van Kley Museum was born. The museum is usually open weekdays from 9 a.m. to 5 p.m. Weekend hours are by appointment only. Museum hours may vary due to the academic calendar. To visit the museum in person, go to the A. Paul Schaap Science Center, room 1040. The Hope College Nature Preserve is a beautiful, 55-acre Beech-Maple forest located within the Western Michigan dune ecosystem. It is home to over 40 species of plants, 14 species of mammals, 40 species of birds and hundreds of species of arthropods. The preserve is located approximately five miles from our main campus and 1/4 mile from the Lake Michigan shoreline in Laketown Township, Allegan County. The preserve is invaluable to ecological research and teaching in the biology department at Hope College. Each year several hundred Hope students utilize the site for hands-on, course-based research. Additionally, several faculty members maintain long-term research projects on the preserve that continue to foster student-faculty collaborative research projects. The students and faculty of the Department of Biology are passionate about our responsibility to protect and manage the property wisely, both for the sake of the college’s academic program and because even small parcels of natural habitat are important repositories of biological diversity. Our species list grows yearly as we explore the property more fully. Unfortunately, it is clear that this property already suffers from many threats (see below), and that these will become more severe as suburban development increasingly isolates the site from larger parcels of natural habitat in the future. One of our most important long-term goals is to use the nature preserve to understand how small parcels of land can best be managed for the maintenance of their biological diversity and the ecosystem services they provide. Although the primary use of the nature preserve is for teaching and research by Hope College students and faculty, the preserve can be visited by those not affiliated with Hope College. However, because research projects are sensitive to disturbance, hunting, camping, horseback riding, off-road vehicle use, mountain biking and cross-country skiing are strictly prohibited. Similarly, collecting plants, timber (previously fallen or otherwise) or animals (including insects) is strictly forbidden. Violators of these policies have been and will continue to be prosecuted for trespassing. Bird-watching and other non-destructive nature study by persons other than Hope College faculty and students are permitted, but only with written permission of the biology department. Any dogs accompanying visitors to the preserve must be on a leash. Persons interested in visiting to the property for such purposes should contact Dr. K. Greg Murray via phone at (616) 395-7716 or via email at gmurray@hope.edu. The links below list species known to occur on the Hope College Biology Nature Preserve. Other species are undoubtedly present as well, and will be added to these lists as they are catalogued. Because of its small size, relative isolation from larger parcels of natural habitat and close proximity to human dwellings, the nature preserve property faces a number of threats. Managing (and, hopefully, reducing) the impacts of these threats on the preserve’s biological diversity and the normal functioning of its communities is one of our major long-term goals. Specific threats include invasive plants, timber salvaging, use by horses and other domestic animals, and various other human disturbances.